Recently, Carmen was asked to share with The Horn Book a book that she was thankful for. Below you can read the piece as it appeared in the magazine. “From the first day, George proved himself possessed of two utterly disarming traits: an insatiable intellectual curiosity and a love for Italian leather shoes that bordered on the fanatical, even for a fox terrier. I had found a soul mate. This said, after he most deliberately—and ironically—devoured a pair of Ferragamo kitten heels, decisive action was needed. I made for the library in search of a training manual. 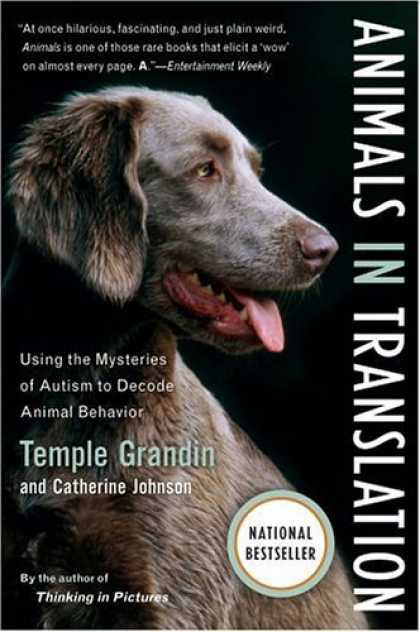 After explaining my plight to my librarian (an encyclopedic woman), I returned with Animals in Translation by Temple Grandin and Catherine Johnson. I settled into a chair, George at my side softly smacking on a shoe strap. As I read, small hairs on my arms rose to attention. A singular and not unwelcome thought arose as well: a dog is a sentient being. I glanced down and met George’s eloquent black eyes. Italian leather be damned, I thought. Am I grateful for that book?